When it worked, it was great. the dual channel was something I wanted so I could have my second channel control speakers outside. 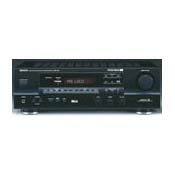 I have just bought it as a replacement for a Yamaha RVX592 receiver. The Yamaha was a pro-logic and a DD ready Receiver I had bought as a second hand as well around 6 months ago. (Paid for the Yamaha 120$ back then) This Denon AVR1100 is also a pro-logic and DD ready receiver. I can't tell you how much happy I am. I sold the Yamaha for 135$ a months ago, and got this Denon1100 for the same price. In short: upgraded for 0$. And what an upgrade it was!!! As a proud owner of a good integrated Denon PMA560 amplifier, I can honestly say that this modest and cheap second hand solution was one of my best purchases in my life. The Yamaha rvx592 I got 6 months ago was a disgrace, And it even gave me ears and head aches after listening to it for more then 30 minutes in a row. This Denon I bought as second hand was astonishing: the DD sound I am now receiving thru my on board DD decoder I have in the DVD is amazingly clean and strong! In contrast to the very unpleasantly sounding Yamaha rxv592 I had before. Also, now for the first time, a real music listening can be made with this receiver. It isn't as good as a strong hiQ integrated, but it surely is 10 times better then the Yamaha 592 I had. In short: Among the low cost solution of a pro-logic and a DD and DTS ready receivers, This monster is one of the best and most cost effective once I have seen and listened to. I can honestly claim that rivals from other brands, doesn’t sound well as this one for twice the price! Pros: Sounds great not only in home-cinema, but also in music. Bright sound, especially on mid's and hi's, Great for opera's, woman voices, hi strings notes and flute playing sounds. Not feathered with garbled fancy features that are really useless, (See case of Yamaha bulsh...it DSP modes) Cons: Could use a little more then 55w per channel, But what can you expect for so little money. :) Conclusion: Grab one of those if you are on that level of budget. The DENON AVR-1100 is a mediocre sort of amp. PROS: The power. The mid-high tonal quality (100hz +). The "stadium" DSP mode. The AC-3 input. The remote control unit is very handy (especially with the pre-programmed variants). Price was decent.CONS: There is no bass in this thing! Below 100hz there is virtually nothing through the main channels! The bass tone knob consequently is useless. The "live" DSP mode is also useless. The fact that you need 16ohm main speakers if you want to run 2 pairs at once (who the Hell has 16ohm MAIN speakers?). otherwise I would have bought something cheaper. the DRA-275 in low freq. Like the DENON quality, though. This receiver definitely deserves more than 3 stars. I find it to be adequately powered for a relatively low priced product at 55 watts x 5. It does not have the same resolution of details with music as the Nad 310 integrated it replaced, nor does the signal to noise ratio seem quite as good. However, there is plenty of punch and it is very easy to use. Only a few sound processing modes, which is fine by me since such "features" simply distort sound anyway. Build quality seems good, switches do not feel cheap to me, other than the clicking sound of what I assume are relays inside when changing from one source to another. Tuner provides great reception, clear and quiet stereo in my semi-rural environment. Overall, I'm pleased with this unit at $500 Canadian. It blends well with my Paradigm Atoms and Axiom powered sub. Have not noticed any lack of bass, but then again have always used the sub and the Atoms don't have much real bass anyway. No receiver in this price range can match a good integrated amp for stereo music listening but I think this one certainly outperforms others such as Kenwood or Technics for the same dollars. And if you have Dolby Digital built into your DVD player like I do, you can enjoy this audio format via the 6 channel input. Less expensive than going with a full Dolby Digital receiver. Finally, 55 watts x 5 plus powered sub is enough for most medium sized rooms. I find this system to have far more punch than when the Nad was in use. Not "high end", but higher than the standard mainstream crap for only a little more cost. This is not a bad receiver. The bass control is not very adiquite. Aperson must turn the nob all the way up for good bass. If the nob is not turned all the way up, then most bass disappears. For home theater, the center channel sound is a little muddy (an effect only heard in larger rooms). If you use this reciever in a smaller room you are fine. If a person is planning to buy this receiver as a home theater unit, all I have to say is there are better receivers to do the job. If a person is buying the receiver for music I would tell them go ahead, as long as they have a subwoofer. The receiver has more than ample power to push my Infinity overture 3's. I feel this receiver is a good product if it is used for less than 40% movies and more than 60% music. I have used this product for over 2 years. It is now on my low grade HT system and it does the job fine. If you are planning to go DD or DTS keep on looking. I will give this receiver a 3.5 stars due to no optical input and muddy center. Since the rest gave 3 stars I will give 4 stars. This receiver is only mediocre. I've bought this reveiver 12 months ago. I have to say I'm very dissapointed. The movies sound good in dolby surrond and it have a 5.1 channel input. But compare to some other products a lot cheaper, in is a bad choice. A KENWOOD 200$ cheaper sound as good as the 1100 for the theatre sound. If you like to listen music, dont hurt yourself with this receiver. You'll miss so many sounds and instrument, in a misrespect for the performers. Finally, with 55W channels you know you dont have to expect much, but at least a bit more than what you'll get from 1100. I should have compare and listen much before I've bought it, the name is good but not enough. I bought a Denon AVR-1100 two weeks ago and brough it home to try out. Decided that I didn't like it, took it back and bought a Denon AVR-1700. and knobs feel very cheap -- I wonder how long they'll last. 2) Not nearly enough inputs/outputs. The sound, as with all Denon gear I've tried or owned, was great. This amp is perfectly suited for a set of polk audio RT1000(I/or/P) with the powered subs in the towers. Unless you plan on running a powered sub with it, or are not a real enthusiast not the best buy. The amp is good clean power, and with the right speakers can be suited for everyone. It is a very good quality product from a reputable manufacturer. Final Thoughts - great all around amp for the money, better than the generic crap on the market, but not a top player.